What do you think of when someone says slushies? Does it bring back childhood memories? Maybe heading to the 7-Eleven for a Slurpee. Or buying a snow cone at the carnival? What was your favorite flavor? Red? Blue? Purple? None of those are actual flavors. But might as well called them that as the red doesn’t contain any actual strawberries, blue doesn’t contain any actual blue raspberries (blue raspberries don’t exist! ), and purple doesn’t contain any actual grapes. But you know what does contain actual fruit? Granita. Today’s post is all about introducing you to this slushy treat that will blow all your childhood memories away. 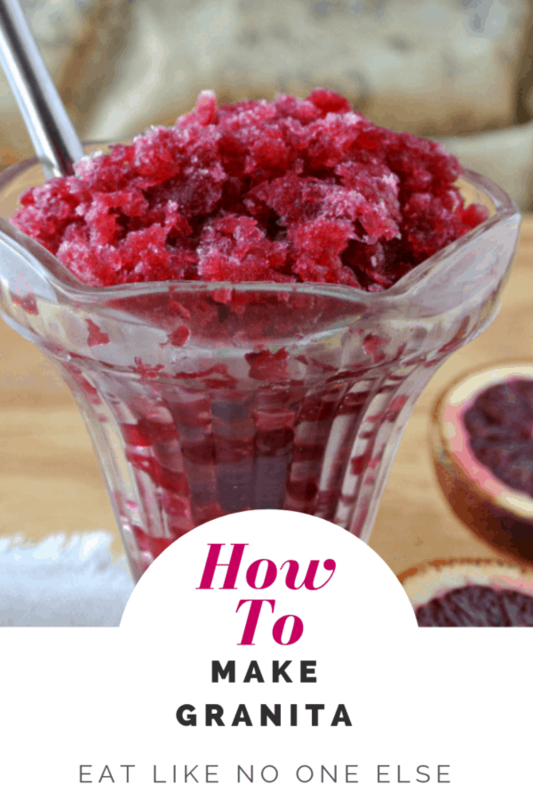 Granita is a super easy to make dessert. Perfect for the kids to give a hand with. 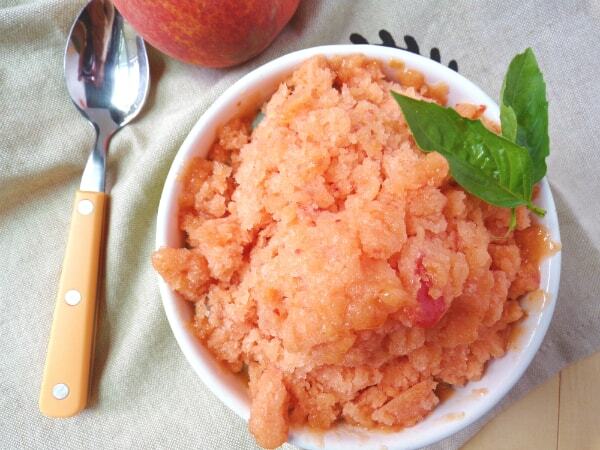 This peach granita is one of our favorites – a definite must for the summer time. Find the recipe below. Granita differs from the 7-Eleven experience in that you are getting real fruit not just some syrup combined with ice. Granita is a mix of pureed fresh fruit, sugar, and water. With this very simply ingredients, the fruit shines as the star of the show. The flavor is beyond any mere slush. The better the fruit the better the granita, which is why I like to make it the best fruits in season. 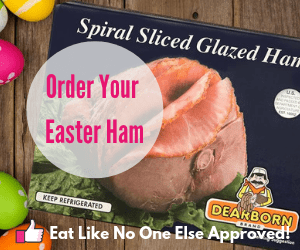 It’s a good dessert to make for those avoiding fat and lacking a way to make your own sorbet, which is also fat free. 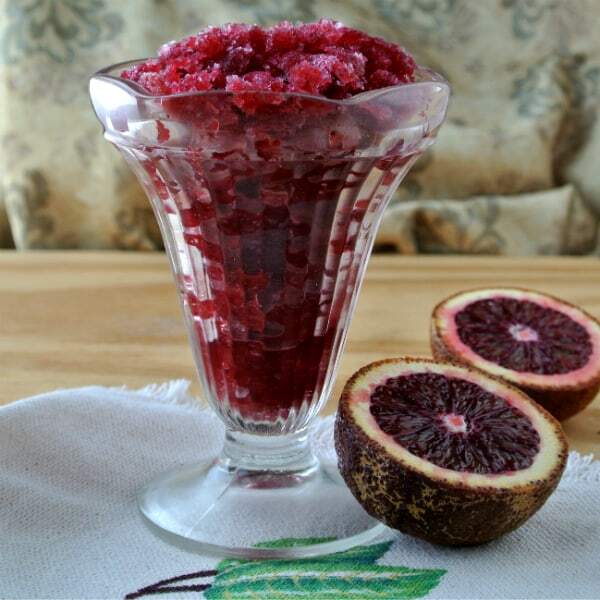 This beautiful granita, is made with just water, sugar, and the juice of some blood oranges. This is the flavor I would make in the winter when blood oranges are in season. The only pieces of equipment you need is a container, a fork, a freezer, and a way to puree some fruit (blender, food processor, etc). Or in the case of the blood orange granita – a way to juice citrus. On a side note you can make granita with already made juice. In the fall, I like to make it with apple cider that I add mulling spices to. What your liquid or puree is, make sure that is has a lot of flavor before freezing it. The coldness will numb the tongue so flavor must be strong to shine through once frozen. Once you have your created a flavorful liquid is it just a matter of scraping the mixture every half hour or so until you have a bowl full of fruity ice crystals. 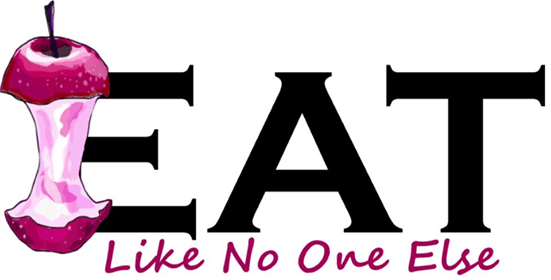 The best tool to do that with is a fork. This breaks up the ice crystals, so that you can get fine crystals. This is what you want for the best texture. If you just froze it as it with scraping it until completely frozen, then you will have large ice crystals and that isn’t as pleasant. The more you scrap the finer the crystals and better the texture. A half hour between scraps is the perfect time amount of time in between. The whole process can take up to 4 hours, but it will be worth the wait. A way to speed things up is use a metal container to make your granita. How Long Does Granita Keep? Granita is best eaten the day you make or the next. Over time the granita will get sticky and the crystals won’t be as nice. It’s best to make just as much as you need for 1 occasion. For a real special treat, you can use granita as a topping for ice cream. 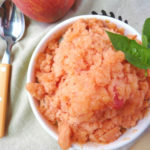 Make the peach granita featured below and serve it on top of some good vanilla bean ice cream. Or you can put the ingredients into a blender and make a cream slush similar to what you can get at a Sonic Drive-In. If you want more granita recipes or just a fabulous book on frozen desserts “The Perfect Scoop” by David Lebovitz is the best book I have come across on the subject. Puree the peach in a food processor until smooth. Add the water and sugar, mix to combine. Put the mixture into a small, shallow metal container. Place in the freezer. 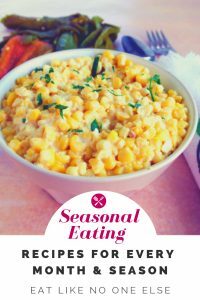 Every 30-45 minutes scrap the mixture with a fork until it is completely frozen.